Sports event coordinators in the Carolinas rely on Royal Restrooms for the best portable restroom solutions to serve a wide range of sporting events. From casual motorsports races to high end equestrian competitions, Royal Restroom trailers are available for rent in a variety of sizes and styles to accommodate any type of event. Cedar Creek Racquet Club, located in beautiful Cashiers, North Carolina, is rated in the country’s top-twenty tennis facilities. The distinguished club recently hosted The United Community Bank Mountain Challenge, one of the summer’s biggest charitable sports events. 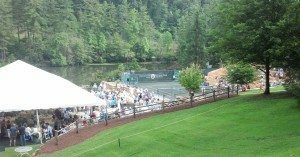 The two-day tennis exhibition featured a gala and matches between tennis champions Andy Roddick and Jim Courier and raised over $200,000 for Mountain Youth Charities in support of the area’s at-risk youth. Royal Restrooms of North Carolina provided the optimal solution to adequately furnish premier restroom service for the upscale event. 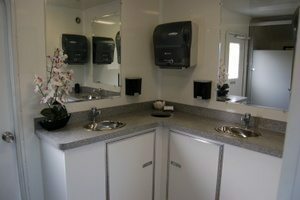 A ten-stall mobile restroom trailer efficiently accommodated the large number of attendees, and an ADA-certified restroom trailer afforded easy access to guests with physical limitations. Players and guests were treated to the comfortable restroom amenities of privacy, lights, air conditioning, running water, premium soap and paper products, and individually wrapped mints on the counter tops. The beautifully decorated, luxury restroom facilities were an enhancement to the top-tier sporting event. For more information on renting contemporary mobile restrooms for your next sporting or social event in the Carolinas, contact Ross or Emerson Waters at (866) 652-3255. Not in the Carolinas? Royal Restrooms offices are located nationwide and are locally owned and operated. Contact your nearest office today. Finding plenty of appropriate and fully functioning restroom facilities for a large outdoor event with thousands of guests can prove to be a daunting task for event planners. However, one call to the right source can solve every restroom problem presented by planners who are looking for comfortable portable restrooms to match their unique event needs. Additional special features, like built in stereos and individually wrapped mints on the counter tops, create the regal portable restroom experience™ for every user. Event planners can easily depend on Royal Restrooms to meet the basic needs of bathroom functions while supplying the best suited mobile restrooms for any event style. Furman University in Greenville, SC, relied on Royal Restrooms for the optimal outdoor restroom solution for the 2013 Spring Commencement Ceremony and surrounding weekend activities. Royal Restrooms of the Carolinas supplied the university with ample portable restrooms to serve upwards of 10,000 people in attendance. Additionally, the upscale restroom trailers paralleled the university’s prestigious reputation and gorgeous campus appeal. Need temporary restroom facilities in the Carolinas? Contact Emerson or Ross Waters at (866) 652-3255 for more information. Read other testimonials about the exceptional portable restrooms service they received from Royal Restrooms of the Carolinas. Contact us for more information nationwide.